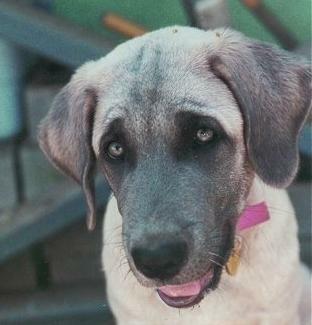 Turkish Dogs - particularly Anatolian Shepherd Dogs: Blue Anatolians... or what color is that dog anyway? Blue Anatolians... or what color is that dog anyway? When registering an Anatolian into the AKC studbook, without colored picture guidelines, a breeder is probably only limited by their imagination on how to apply the colors below to a dog that is being registered. 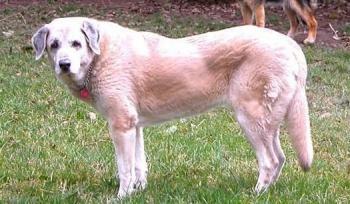 Colors listed are determined by the breed Parent Club, in this case, ASDCA (Anatolian Shepherd Dog Club of America). My comment on this regards that fact that the codes seem to not make much sense genetically, so I think that the ASDCA should eventually get around to correcting this. If one has a chocolate/liver/brown Anatolian, that means due to the dilution effect of the brown gene, the nose and eye rims as well as the hair on the dog cannot approach true black, but depending on depth of pigment in that particular dog, will have varying degrees of depth of chocolate color. The eyes as well, cannot be deeply brownish because there is no black pigment that can form in the eye -- they will tend to have amber eyes as they reach their adult coloration. Eye color development generally shifts from bluish-greenish to amber at some point before the dog's first birthday. So on the selections of color for registration, one could choose the base body color as being LIVER (123) and having the markings of BROWN MASK (076). Now suppose you have a puppy that is a blue Anatolian? This is a dilution that allows a blackish tint in places that would be black on a nondilute Anatolian, such as on the whiskers, guard hairs, black mask, ears, etc. But... rather than full development of black, the "black" areas will have an "off black", slate blue, or putty greyish color on the nose and eye rims, depending on the particular dog's depth of pigment. So in the case of the blue fawn dog, the base body color would be selected as BLUE FAWN (036) and with what color markings? If the dog in question has strong pigment, the mask can be "almost black" rather than pewter or silverish. So does the owner register their blue dog as having a black mask? The mask isn't black, it can't be if the dog is a genetic blue. And as in in the case of the chocolate dog, the eyes themselves do not have the depth of color that comes with black pigment, so their eyes will develop into a shade of amber over time. I think this (selection of the black mask option for blue dogs) has been the case since breeders have no choice with the current selection. 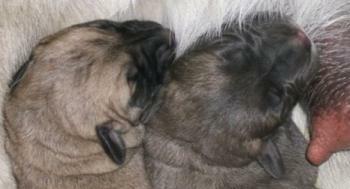 i have a anatolian brindle i think and i have questions u can contact me at h.lp@live .com thanx.